According to the book, Mamma Mia! How Can I Resist You? when the creators were developing the show, they were adamant about how it should look. Scenery was not to slide on from either side of the stage; there were to be no backdrops lowered from above to suggest a new scene-setting location; and it wasn’t to be like traditional Broadway faire where a whole new environment was established once characters entered a bedroom or the action took place in a separate area. It was to remain sparse, a basic exterior of a Greek island taverna that could be slightly angled from time to time to suggest a change of scenery. And it was all to be bathed in whites and Mediterranean blue. In other words, it wasn’t to look like a musical. There were even instructions on the choreography and how songs would be presented. There were to be no showy Broadway moves, no jazzy hands, and no precision in the dancing. It was to appear like a free-for-all, where characters did their own thing – organized but not chorus-line skillful. The creators considered it a play with music with the emphasis on story; the music, secondary. Plus, artists were not to break that fourth wall and sing directly to the crowds. Of course, they should be positioned where they could be seen, yes, but they were not to acknowledge they were performing in front of anyone. They were either singing to themselves as if lost in musical thought, or to each other. And because of its island setting and writer Catherine Johnson’s Shakespearean plot construction, it was to appear as a place where you could stage The Tempest without making changes. And it worked. When the show opened in 1999, a London newspaper reviewer declared the show ‘A WINNER!’ in huge block letters, a design that soon became the principal advertising blurb across many of the posters. Naturally, Arizona Broadway Theatre in Peoria, a place where its very tag reads Arizona’s Leader in Musical Theatre, was having none of that. If any place knows what its audience wants and what it takes to make an entertaining crowd-pleaser, it’s ABT. The best way to consider the dinner theatre’s new production of the Abba jukebox musical Mamma Mia! now playing until April 20, is to consider this Clayton Phillips directed production as re-imagined. 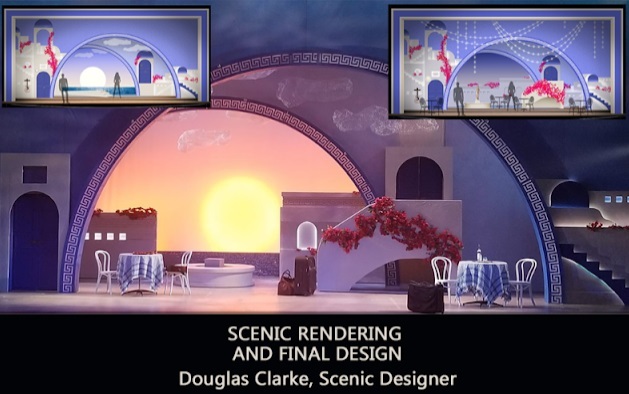 Douglas Clarke’s new scenic design recreates the island’s taverna with a large courtyard viewed through oval openings. It’s flanked by stone granite whitewashed walls where the doors and windows presumably lead to all kinds of separate rooms and cellars, plus on a back screen you can see a mostly clear blue sky – there are a few puffy clouds hanging around for good measure up there – while the iridescent blue of the Aegean literally and effectively glitters on the water’s surface. When the setting changes from the exterior to the interior, new additions to the set slide in from either side. And in order to create a whole new environment, the walls and windows of a bedroom are lowered from above. It might not do for Shakespeare’s The Tempest, but at a pinch, the Greek version of Kiss Me, Kate might be workable. The script itself isn’t changed, but some of the characterizations are altered. A clear and pleasant voiced Alexandra Carter plays young Sophie, the girl with the sun-kissed golden hair who is about to marry her island boyfriend Sky (Nicholas Kuhn). This could well be the first time Sophie is portrayed sporting a couple of arm tattoos. 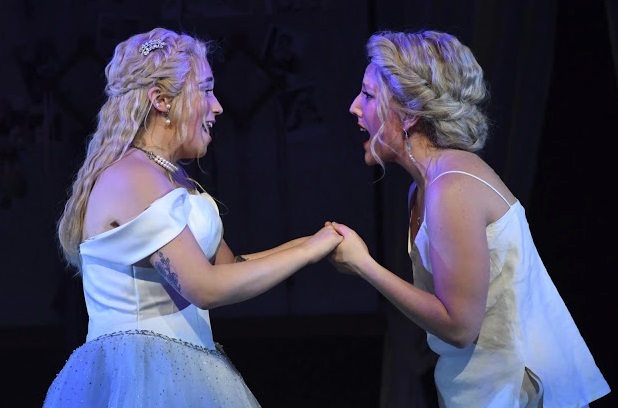 Sophie has always wanted to know who her father was – she was raised on the Greek island by a single parent, her mother Donna (Kaitlin Lawrence, equally sun-kissed with golden blonde locks, courtesy of Amanda Gran’s wigs). Upon discovering her mother’s diary and secretly reading about of all of mom’s past indiscretions, Sophie has her potential dad narrowed down to three men, all of whom she invites to the wedding. The three are Harry (Brian Ashton Miller), Bill (Andy Myers), and Sam (Matthew J. Taylor) and all three turn up at the same time. As written, and usually performed, the conflicts are twofold; which one is Sophie’s father – “The sperm donor has a name,” says Sophie – and which one might rekindle that unfulfilled relationship of the past with the still single momma Donna. The father part is something to be discovered, but which of the guys will end up with Sophie’s mom is hardly a guessing game when it’s clear in this production who the suitor will be from the moment all three men make their entrance. Bill, the world traveler in shorts, is a big, burly guy with a big, burly beard. If he ever really appealed to Donna in his youth, from his appearance and those hairy legs, that time has passed. So it has to be down to the other two. Normally you’d be kept guessing. For the record, there’s a reveal near the end that humorously points out Harry’s sexual orientation, and it’s supposed to come as a surprise. But at this point, it’s hardly a plot-spoiler to say that it won’t be Harry as Donna’s suitor considering that in this ABT production, Clayton Phillips has directed Brian Ashton Miller in his ABT debut to play the part broadly gay. Purists of Mamma Mia! might not be happy, not to mention how Colin Firth who played Harry in the film might feel about this interpretation, but in line with everything else re-imagined, the majority of ABT patrons won’t care. By playing the character this way, the role earns the production extra laughs where none used to be. When Harry states to the other two guys, “Donna knew my wild side,” all that can run through your mind is, I seriously doubt it. When Bjorn and Benny of Abba wrote those lyrics – impressively in a second language – they were to be sung mostly by Agnetha and Frida. As a consequence, the guys had to write in character. Look at those lyrics. There’s no ambiguity. They often tell a story from a specific character’s point-of-view, which makes them ideal to be used in a musical that’s not simply a revue. Music director Mark 4man and his band hold a solid, tight rein over the music arrangements, while the cast all do fine work with those indestructible pop/rock songs. There’s not a Pierce Brosnan among them. 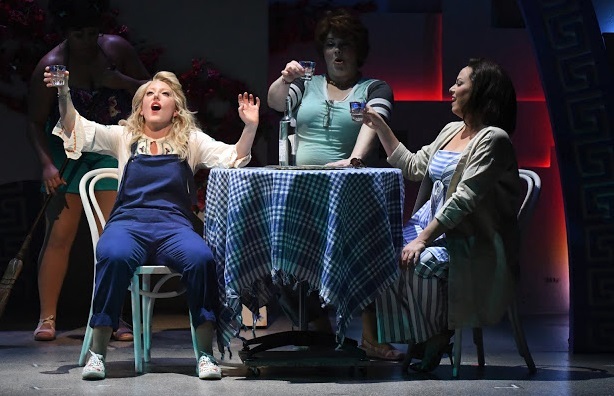 Sounding particularly good is Super Trouper, sung by Lawrence and her two immensely likable girlfriends, Tanya (Jessica Medoff) and Rosie (Chae Clearwood). 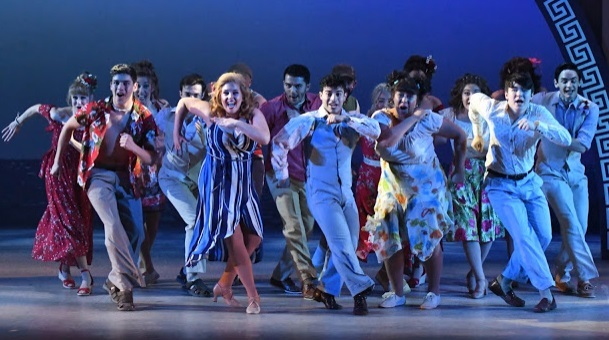 Kurtis Overby’s choreography – it’s vigorous movements are organized, precise, and definitely chorus-line skillful – may not include those jazzy hands but its origins are clearly Broadway. And when characters sing, they often turn to the audience and perform directly to us, ignoring the rules of being in a play with music while presenting the numbers as if in a variety show. But again, like Harry’s broad portrayal, the audience for whom this production is designed won’t care. ABT’s energetic Mamma Mia! sparkles as brightly as the glittering sunlight on that Aegean sea surface. It may not be the show that the creators during the nineties envisioned, but like that London newspaper blurb used across the poster, when it comes to knowing unquestioningly what pleases an ABT crowd, this Mamma Mia! is every bit ‘A WINNER!’ as the original show was, though admittedly for some very different reasons.